What was that ‘presidential alert’ test that appeared on your cell phone today? 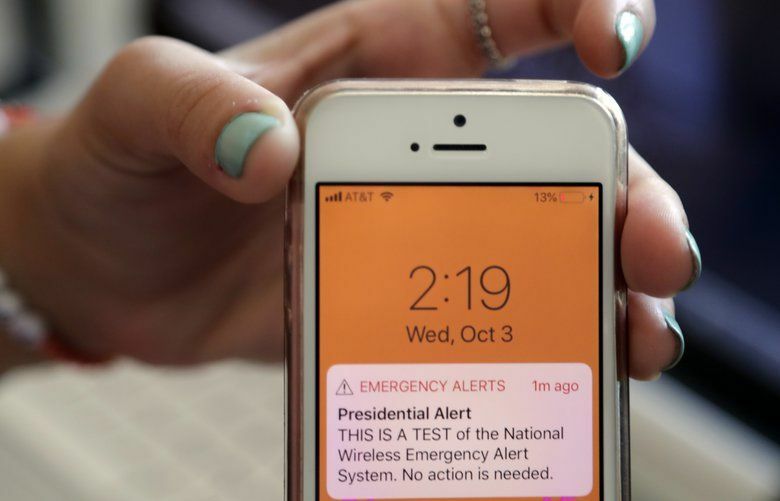 A “presidential alert” appeared on cellphones nationwide Wednesday, Oct. 3, 2018. It was the first test of the national wireless emergency system by FEMA. A tone sounded on cellphones across the country at 11:18 a.m. Pacific time, similar to that of an Amber Alert or flood-watch warning. It was the first test of the national wireless emergency system by FEMA. WASHINGTON — About 225 million electronic devices across the United States wailed and buzzed Wednesday morning as the Federal Emergency Management Agency conducted an emergency alert test. It was the first test of the national wireless emergency system by FEMA. The message is being broadcast by cell towers for 30 minutes, so it’s possible some people may get it at a different time. The alerts sounded as long as the device was turned on — even if it was on mute or do not disturb, and it may also have appeared on smartwatches, officials said. A second alert on television broadcast and radio will go off at 11:20 a.m. Pacific time. The TV and radio alert has been tested for several years. 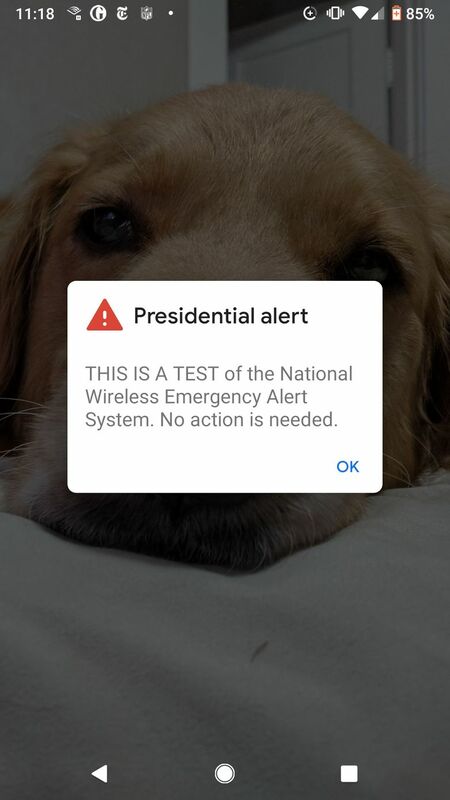 The system test was for a high-level “presidential” alert that would be used only in a nationwide emergency. It is being completed in coordination with the Federal Communications Commission. FEMA officials said Tuesday they would share test result data on how the testing went with mobile carriers to help ensure the system works well in a true emergency. Phones with mobile carriers that participate in the wireless emergency alert system, which sends out information on hazardous weather, or missing children, would have received the alert. FEMA officials estimated it would reach about 75 percent of all mobile phones in the country, including phones on all of the major carriers. FEMA officials said the administration can send such an alert only for national emergencies or if the public were in peril, rules outlined in a 2006 law, and they say it can’t be used for any sort of personal message from the president.